Here's a mix of recent news and personal past with a chance Veblen House connection. Kuiper, a name familiar to me from childhood, was in the news as 2019 began. In the wee hours of January 1st, NASA's New Horizons spacecraft flew by "Ultima Thule," an object 4 billion miles from Earth in what is called the Kuiper Belt, home to Pluto and other frozen objects in what has been described as "a vast rim of primordial debris encircling our solar system." 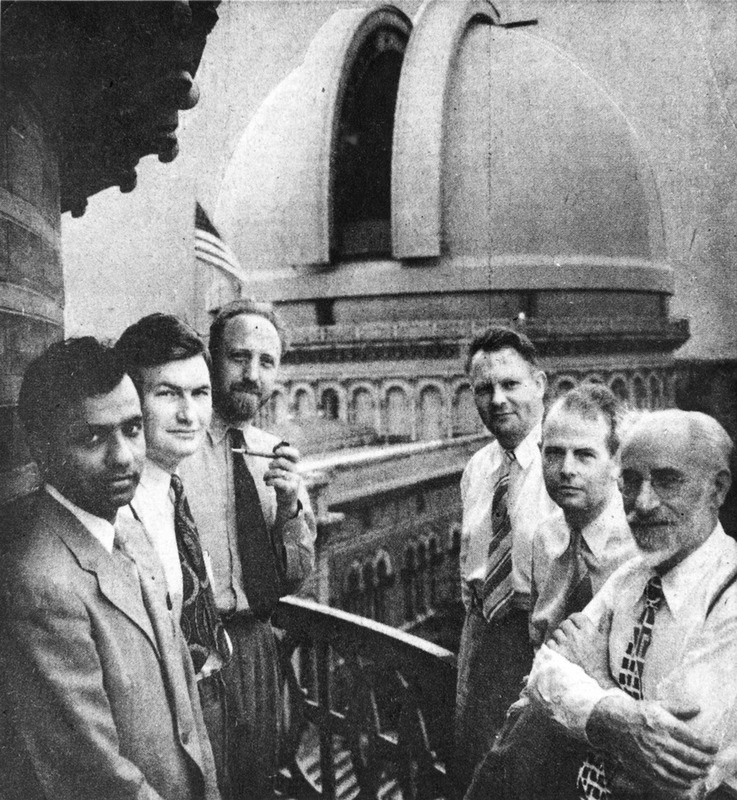 The term "Kuiper Belt" was new to me, but astronomer Gerard Kuiper for whom it is named was a colleague of my father's at the University of Chicago's Yerkes Observatory. Kuiper's best known student was Carl Sagan, an astronomer who later did much to popularize science through his Cosmos television series and many books. From my recent correspondence with one of Sagan's friends and fellow student, Peter Pesch, it looks like Sagan was pursuing an unusual route in astronomy even back then: "Kuiper was exclusively interested in the solar system, which few of us were, except, of course, Carl Sagan." 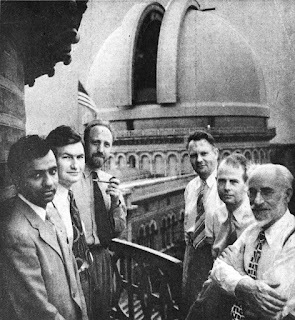 In the photo, my father Al Hiltner and Gerard Kuiper are 2nd and 4th from the left, respectively, with Nobel prize winner Chandra first on the left. Mary was an eighth generation descendant not of Mayflower pilgrims, but of a pilgrim who settled in what would become New Jersey, John Ogden. Update: In another unexpected link between Yerkes Observatory and Veblen House, I recently contacted a U. of Chicago alum who had written a strongly worded letter to the alumni magazine lamenting the university's having moved out of the observatory. The author, Daniel Campion, happens to live in Iowa City, where Oswald Veblen grew up. Daniel took a break from his writing to research Veblen's childhood home, which will be the subject of another post. He also sent me a "squib" he had published--a short poem about Ultima Thule called "Marriage Made in Heaven."